If you have been keeping up, the 2016 USA Greco Roman’s fall Sweden tour has been able to provide a lot more coverage than past jaunts overseas, especially with the live stream of Wednesday’s dual versus Team Skåne Brottning. The trend will not be changing for the last competition of the tour — you will able to follow along and watch the action live later today, too. The US wrestlers will be competing at the Malarcupen in Västerås, about an hour and change from Stockholm. What makes the Malarcupen interesting is that it includes virtually all age divisions. For the males, it is an all-Greco tournament. For the females, it is freestyle. Wrestling begins at 4am EST/3am CT, so in other words, very soon. Fans who would like to watch live or the replay of the event can do so by going to the Combat WC Facebook page and sending a request. If you would like to keep track of real-time results, just click here. As of now, there is no definitive word on exactly who from the US will be competing. Thus far, Alston Nutter, Eric Spence, Logan Hatch, Hunter Lewis, Joshua Frye, and David Prado are confirmed. A full list of athletes should be available later. So far, it has been a pretty successful trip for the US contingent, which is comprised primarily of athletes from the Northern Michigan-Olympic Training Site program. 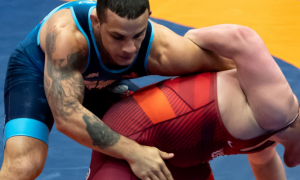 Jordan Auen (59 kg) and G’Angelo Hancock (98 kg) both took gold last week at the Klippan Cup. Then Nutter, Jordan Martinez, and Michael Donato scored wins in the team dual against the much more-experienced Team Skåne Brottning. 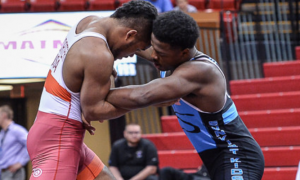 And it is important to note that both Nutter and Martinez are still in high school and have chosen to train in Greco on a full-time basis (Nutter at NMU and Martinez at the OTC). We will of course have a summary of the Malarcupen following its conclusion as well as a full wrap-up of the Sweden tour this week. Stay tuned!